Steel, 45 foot, workmans van, built by Commonwealth Engineering. Contract No. 3218. 4.1.1972 Entered service on the North Australia Railway as "NEG 89". 6.4.1978 Transferred to standard gauge and recoded "EG 347". 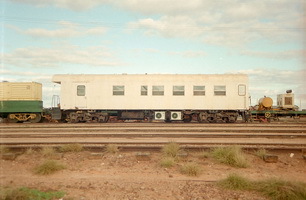 By 1995 Allocated to CME as work van at Port Augusta. 15.3.1997 At Port Augusta painted green and gold. - Painted all over orange.